This paper argues that for the full economic revitalization of South Africa to take place, a critical step is to engage the synergistic effects of ubuntu or ‘humanness’, a philosophy which informs the thinking of a majority of South Africans. Ubuntu acknowledges that people are not just rational beings but that they are also social beings who possess emotions such as anxiety, hope, fear, anger, excitement and remorse. The position taken here is that openly recognising these human dimensions and accommodating them in everyday practice can unleash the synergistic effects of ubuntu. The paper gives examples of situations in which ubuntu manifests itself in the workplace, and provides lessons that can be learned from those situations. Among the advantages that can arise from harnessing the advantages of ubuntu are improvements in the corporate goals of employee satisfaction, productivity improvement, workplace harmony and, ultimately, the development of a vibrant economy that will further enhance the global competitiveness of the country. The dismantling of apartheid over a decade ago was a watershed event in the history of South Africa. The world watched as the country charted its course toward the establishment of a democratic, non-racial, non-sexist, system of government. With the democratic processes now firmly in place in the political arena, the spotlight has shifted to the economic revitalization of the country. But, as this paper will argue, sustained economic revitalization will not be possible until due regard is paid to the voices and aspirations of those who had been locked out of the democratic process for centuries. An important step in that direction is to understand the culture, values, norms and beliefs that predispose individuals to behave in certain ways. It is well known that individual behaviors and decisions are strongly influenced by prior socialization. Prior socialization itself is predicated on philosophical thought systems, which are strongly influenced by culture, norms, beliefs, history, folklore, and mythology; and religion (Hostede 1991; Roer-Strier and Rosenthal 2001; Thompson and Lufthans 1990). These relationships are shown schematically in Fig. 5.1. The key to understanding the attitudes and behaviors of Africans in the workplace lies in learning about the philosophy of ubuntu. As a philosophical thought system, ubuntu shapes and informs the beliefs, values, and behaviors of a large majority of Africans in South Africa. Whether it is a critical issue that needs be interpreted or a problem that needs to be solved, ubuntu is invariably invoked as a barometer for good versus bad, right versus wrong, just versus unjust. Ubuntu can be viewed as an essential frame of reference for understanding African culture in South Africa (Brack, Hill, Edwards, Grootboom and Lassiter 2003; Lufthans, Van Wyk and Walumbwa 2004). In this essay we use Clifford Geertz’s (1973) understanding of culture as the web of understandings humans have spun. To Geertz (1973: 89), culture is an historically transmitted ‘pattern of meanings embodied in symbols, a system of inherited conceptions expressed in symbolic forms by means of which [men] communicate, perpetuate, and develop their knowledge about and attitudes toward life’. We believe that culture is something that evolves over time in response to the conditions in which actors find themselves, whether social, economic, political, technological, ecological, and so on. This strongly implies that culture is not an abstraction, but a mutable social construction. The historical formation of culture thus becomes a source of primordial sentiments which are the ‘givens’ of a particular group because over time they carry a shared and understood meaning that is of absolute importance. As a component of culture, ubuntu evokes existential feelings akin to primordial sentiments (Shils 1957; Stewart 1987; Emminghaus, Kimmel and Stewart 1997). As will be seen in this chapter, these primordial sentiments provide reference points (respect, cooperation, solidarity, empathy, etc.) necessary for creating and maintaining stable identity and peaceful coexistence. [i] In this chapter we will give examples of situations in which ubuntu manifests itself in the workplace, and provide lessons that can be learned from those experiences. It will conclude by arguing that an understanding of ubuntu is the key to accomplishing the goals of employee satisfaction, productivity improvement, and ultimately workplace harmony. Over the centuries of their rule in South Africa, the colonial and later apartheid governments have perpetuated the fact that the African population of South Africa is composed of at least eleven ethnic groups, each with its own unique linguistic and characteristics and historic evolution. A superficial assessment of this incredible diversity would seem to preclude the identification of a common character among these ‘ethnic’ groups. But this would be overly naive, since it belies the underlying distinguishable pan-African character that binds African people, which is a product of its unique geographical, historical, cultural, and political experience (Sithole 1959; Antonio 2001). No other feature can more powerfully capture the essence of this pan-African character than ubuntu. The word ubuntu (botho) is a derivative from umuntu (in isiZulu), umntu (in isiXhosa) or motho (in Sotho), which means a person or a human being. The plural form in both isiZulu and isiXhosa is abantu or people. Literally, therefore, ubuntu means the state of being a person or human being. But when Africans use the term, it is associated with the kinder, gentler, and nobler qualities of human interaction. So for example, when someone performs an act of kindness, they are said to have ubuntu. Having ubuntu means being respectful, being generous and giving, preparing the extra plate of food just in case a stranger showed up, going the extra mile in helping those in need without expecting anything back from them. Loosely translated into English, ubuntu means humility or humaneness. As noted above, ubuntu runs deeper than that. It serves as the foundation for the basic African values that manifest themselves in the ways people think and behave toward each other and everyone else they encounter. It is lamentable that, until recently, these values have largely been ignored in the management discourse. For a long time the discussion of the concept of ubuntu has been limited to other fields in the social sciences such as theology (Sithole 1959; Setiloane 1986). It is only fairly recently that it found its way into the field of management (see See Khoza 1994; Senge, Kleiner, Roberts, Ross and Smith 1994; Makhudu 1993; Mangaliso 2001; Mbigi and Maree 1995; Prinsloo 2000). It is our contention that any effort to bolster economic vitality while, at the same time, creating a healthy work environment will necessarily have to begin with understanding and incorporating the fundamentals of ubuntu into management practices. The management practices referred to here include productivity improvement, leadership training, decision-making, and group dynamics. It is our hope that lessons from this paper will contribute toward a greater understanding of ubuntu, and thus provide useful knowledge for management practitioners and theorists with an interest in South Africa. The focus of the discussion in the paper will be on the various aspects of ubuntu as they relate to relationships to others, language, decision-making, attitude toward time, productivity and efficiency, leadership and age, and belief systems. These were selected since in the view of these authors they bring into stark relief the essential nature of ubuntu as described above. They will now be discussed in turn. A central part of ubuntu is the interdependence of humans in a social context. The driving norms emphasize reciprocity, suppression of self-interest, and the virtue of symbiosis (Mangaliso 1992). Hence it is often said that umntu ngumntu ngabanye [a person is a person through others], a statement which conveys the notion that a person only becomes a person through his/her relationship with and recognition by others. This recognition has far-reaching implications in day-to-day interactions among people concerning an individual’s status in society. For instance in the isiZulu language, the greeting ‘Sawubona!’ translates into ‘We see you!’ This is a tacit recognition by others of the individual’s existence as a human being. The greeting often also includes an honorable designation such as Nkosi (honored one, as in king), Baba or Mama (father/mother, a salutation extended not just to one’s actual parents, but to everyone of their age group). This emphasizes the importance of the individual within a wider network of social relationships. Also noteworthy is the usage of the plural voice by the individual, which underscores the preeminence of the collective over the individual. The response to the question, ‘Ninjani?’ or ‘How are you?’ is, ‘Sikhona!’ literally meaning, ‘We are here!’ This in effect acknowledges the presence of personhood within the collective. As a matter of fact, there is no worse ignominy among Africans than to state that someone akangomntu (Setiloane 1986). This means that this person is not human – implying that she/he is an isilwane (an animal). The pre-eminence of the collective can be observed more closely in the extended family as a unit of organisation. Here the emphasis is on the unity of the whole rather than the distinction of the parts. This holistic approach is supported by an ideology that reveres the concentric linkages of individual to family, to extended family, to clan, to village, and ultimately to the entire community. The individual is a member not just of the nuclear family, but also of the extended family or clan. Your mother’s sister is equally your mother, and your father’s brother is your father. If your mother has two sisters and your father two brothers, then you’d have three mothers and three fathers. This has often presented problems to companies who offer paid leave of absence for the death of immediate family members. At Unilever, a white fellow manager once remarked to me that one of his employees was being deceitful. When I asked why, he told me that the employee was asking for a few days paid leave for the death of his father. There was nothing wrong with that, he said, except just two years ago the same man was given three days of paid leave for the death of his father! How many fathers can a person have? In the western understanding, your uncle is not your father. In company policy he is not a member of the nuclear family and hence is not covered under the bereavement scheme. But in the African world-view he is. World-view is defined as the way reality is socially constructed by a people, or their collective consciousness (Burger and Luckman 1967; see also June 2005). There are some who have cautioned about the potential for abuse of individual rights imbedded in the collectivist tendencies of ubuntu (Mbigi and Maree 1995; Sono 1994). Tremendous demands are placed on conformity and loyalty to the group through sanctions and punishment. However, in real essence, ubuntu allows for a certain amount of individual dissention as long as it does not undermine group harmony. As a complex social tradition, ubuntu actually recognises both the importance of the individual and the needs of the group. On the one hand, individual needs are accommodated by providing opportunities for all to participate and contribute in group processes, decisions, and activities. On the other, individuals are expected to contribute to the groups and to support group decisions. This is not socialism, where the needs of the individual are secondary to the needs of the group. Ubuntu enmeshes the needs of the individual in the needs of the group. 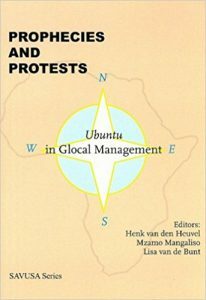 The similarities between ubuntu and its related social traditions and some of the recent writings on management theory are striking. For example, the ‘fusion’ metaphor has been used for a style of management described as ‘achieving a sense of unity, coming to see others as part of the same whole … seeing similarities rather than differences… common ground and a sense of community based on what people share – vision, norms, and outcomes’ (Marcic 1997). Another example is the concept of ecological embeddedness, which emphasizes social relationships and reciprocity (Whiteman and Cooper 2000). These suggestions might sound revolutionary in a western setting that emphasizes individuality, competition and control, but in the context of ubuntu, fusion and ecological embeddedness are a social reality and manifest themselves in everyday relationship patterns. To sum up, we posit that management must familiarize itself with the way people relate to each other in the traditional African way. Whenever practicable these relationships should be taken into account when formulating company policies. Such policies might include recruitment, job placement, promotion, transfer, reward, discipline, and even retirement. In the newly democratized South Africa, companies whose policies are perceived to be responsive to the needs and worldview of their employees will out-perform those that are perceived to be otherwise. Communication is to the organisation as blood is to the body. But major ontological differences exist in communication between the linguistic world of the African and that of the westerner (Kiggundu, Jorgensen and Hafsi 1983; Mangaliso 1991). In the African milieu, children are socialized from birth to listen to the context and nuances of language in conversation. The importance of language in establishing a sense of community belonging, shared heritage, and common welfare is emphasized. Words are enmeshed in dense fans of association that might be unwittingly activated by mere mention (Comaroff and Comaroff 1989). The pervasive axiom is that to talk and to name is to create experience, to construct reality. The oral tradition – described in later writings as oral literature – has been the most dominant medium for passing on ideas, beliefs customs, and culture to successive generations. 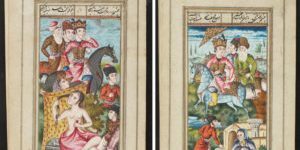 Until the middle of the nineteenth century, it was through the oral tradition that African folk proverbs, ballads, legends, and mythology were sustained and kept alive rather than through detached written form. The transition from oral to written literature in most of Sub-Saharan Africa emerged only as part of the struggle against European hegemony, which led some to describe it as the ‘fight-back’ literature (Jordan 1995; Stapleton 1991). These intergenerationally transmitted stories have often formed the bedrock of reason, wisdom, and morality (Ahiauzu 1986). A mastery of the art and skill of oratory is often a prerequisite for leadership. This becomes even more so during celebrations when skillful orators will take center stage with their poetry and praise-singing. Organisation studies researchers have shown that during communication people from individualist cultures tend be content-specific, paying close attention to what is being said; and those from collectivist cultures tend to be context-specific, paying close attention to how something is said (Hostede 1980; Gudykunst 1991; Triandis 2001). The largely individualistic western society places great emphasis on the performative quality of language usage, with primacy given to content and the efficiency of information transfer. Ideas must be translated accurately into words, the medium of the exchange must be appropriate, and the receiver must accurately understand the message. In the predominantly collectivist African society, however, the social effect of conversation is emphasized with primacy given to establishing and reinforcing relationships. Unity and understanding among affected group members is valued above efficiency and accuracy as the following examples demonstrate. The language one uses in conducting business in any given culture is intricately interwoven with the idiom of that culture. Among the amaXhosa of the Eastern Cape, for example, the practice of ukunqoma was used extensively in the 19th and early 20th centuries. The word can literally be translated into English to mean ‘to loan’. In the African reality, the word does not translate into a similar notion of loaning as is understood in the west. It is a practice whereby an individual loans his/her cow to a neighbour for milk. The borrower can keep the cow for an indeterminate period of time and if, during that time, the cow gives birth to a calf, then the calf belongs to the borrower. However, the lender can, at any moment and without notice, come to repossess his/her cow. Hence the idiom ‘Inkomo yenqoma yintsengw’ ebheka’ was coined. It means that you ‘milk a loaned cow while constantly looking back over your shoulders’ since the owner can reclaim it anytime. As can be imagined, the personal rapport, or the sense of what is being said, is lost in the translation. The surge in interest to learn an African language as indicated by increased enrollments in African language classes in the years following the South Africa’s first democratic elections was an encouraging sign (Crowe 1995). While recent reports indicate a lack of institutional support for this surge, it indicated increasing realization that learning to speak an African language is an important means of understanding their culture and patterns of interaction (see Bisetty 2000; Salie 2005). In culture and language there are norms and expectations about how people address each other regardless of rank; how they greet each other; the personal space they maintain; and the expectations they have of each other. Western organisational theories – with the exception of the neo-Marxist perspective – concentrate on the factors affecting productivity: how fast, how plentiful, and how well something is produced, and … how well and how efficiently people are processed, sustained, or changed. 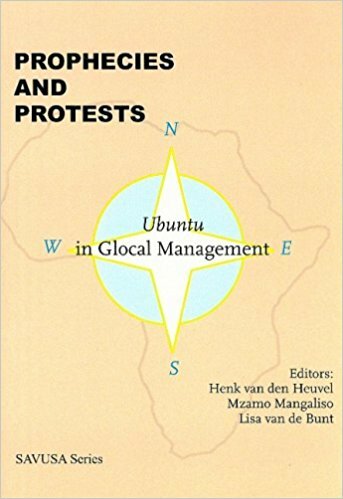 What makes western management thinking particularly untenable from the Africa-centered[ii] perspective is that its assumptions run counter to the core value of ubuntu. A dilemma is then created when western management principles are imposed on a workforce whose culture upholds such values such as caring, cooperation, community, and consultation and in whose mind the individual cannot exist outside the collective. 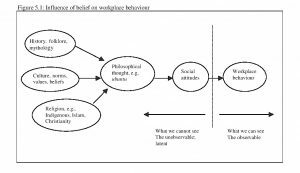 This creates a situation of cognitive dissonance which, as many studies have shown, tends to manifests itself in lowered morale and reduced productivity (Aaker 2002; Festinger 1957; Moser 1988; Terkel 1974). What can be learned from this discussion is that in the African work environments attempts to stifle conversation and discourage interaction will be counterproductive and lead to dysfunctional behaviors and ultimately an alienated workforce. Allowing workers to establish relationships, even when not required by the task structure, will improve effectiveness and decrease disruptive and antagonistic behaviors. We next consider the case of decision-making. Decision-making processes followed in the African context differ markedly from those in the western context. In the western literature, decision-making is defined as the conscious choice of a course of action from available alternatives. The process is typically linear in that one decision sets a precedent for the next. Also, the parameters are reasonably well defined, and, therefore, speed to closure is taken to be meritorious. Vision is usually monocular because unity of vision is idealized. The goal of decision-making is to arrive at the right choice, to select the alternative that best satisfies the decision parameters. 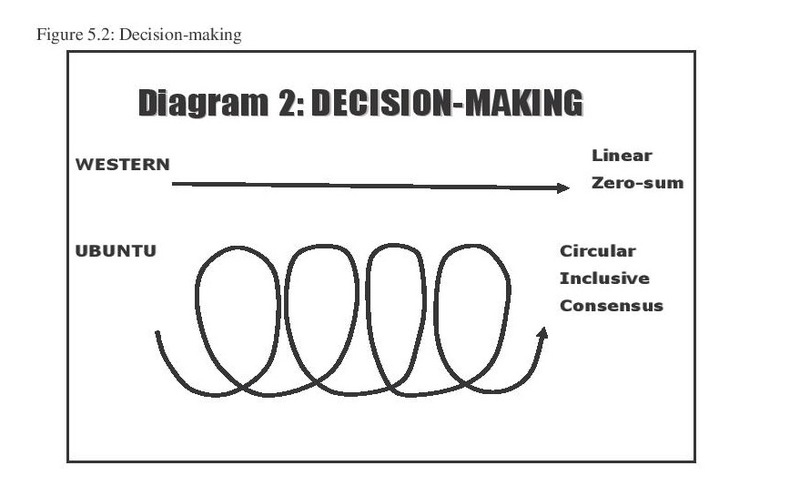 From an Africa centered perspective the decision-making process is circular and inclusive, proceeding at a deliberate speed, and often given to deviations in order to delve into other matters however remotely related to the issue at hand (see diagram 2). Vision tends to be polyocular. In other words, those who look at issues from different angles are seen as interesting and as providing valuable insights. Diversity of vision is not only permitted but also protected and encouraged. Before closure to the issue at hand is arrived at, considerable time is allowed to assure that all voices have been heard and that a consensus has been reached. The goal of decision-making in an African context is to preserve unity and achieve consensus. A decision that is supported is considered superior to the ‘right’ decision that is resented or resisted by many; unity is more important than utility in decision making. Nowhere are these differences better demonstrated than in the way negotiations were conducted between the white South African government and the various black political organisations during the CODESA (Congress for a Democratic South Africa) talks near Johannesburg in 1993. These were the talks that led to the first democratic elections in 1994. Although they outnumbered the white representatives by far, not once did the blacks (led by the African National Congress) put any of the critical decisions to a vote. All major decisions were made by consensus, often after a lot of behind-the-scenes discussions to bring other parties into agreement. These talks resulted in the formation of a Government of National Unity (GNU), which went on to run the country for the next five years. This is not to suggest that decision-making by majority has no place. It does, and can result in reaching a more optimal, but less supported solution. A solution based on African ubuntu-style consensus decision-making might often not be the best solution, but because of the large base of support it enjoys, it is usually more successful at the implementation stage (Mangaliso 2001). The distinctions between the western and African decision approaches pointed out above suggest that western-style bureaucratic approaches to problem solving will often be ineffective in the African worldview. By limiting involvement and imposing control over employees, these approaches often lead to ineffective organisational outcomes and dysfunctional behaviors in the workplace. Consensus-based decision-making, although initially costly in terms of time and effort, is more likely to result in improved commitment to organisational goals. As research has shown, the results will be seen in reduction in supervisory requirements, decrease in turnover and absenteeism, increased efficiency and effectiveness (Pellow 1999; Homburg et al. 1999; Stasson et al. 1991). Another area of difference between the African and western ways of life is attitude toward time. These differences can present a problem in the manner in which westerners engage in conversation with indigenous Africans. [iii] Sociolinguistics has demonstrated that there is a level of discomfort in the different ways that western and African cultures interpret pauses and silences during conversations (Chick 1990).Westerners are inclined to fill the pauses with words; Africans appreciate periodic gaps of silence within a conversation. American managers are believed to have one of the highest talk-to-listen ratios in the world. An African manager is said to have cynically asked his American counterpart whether he ever had a chance to breathe between sentences. A case in point involves a western salesman who had secured an hour-long appointment with a Zulu customer at his home near Stanger in KwaZulu-Natal. When the salesperson arrived punctually, she was upset that her host was not ready. It took a while before the host finally came out to meet her and begin the scheduled discussion. The salesman found out later that in the Zulu culture when you have an appointment at someone’s home, it means s/he has control over what happens in that time period. By agreeing to meet at the home of the client, the salesman was tacitly agreeing that it was up to her host how she would prioritize her time between family activities and business discussion. Unlike in the western context where time is a strategic commodity to be productively used, in the African context it is treated as a healer. Time is not a commodity to be frugally consumed, a tool to be carefully utilized, or a regulator to be dutifully observed. In Greek this conception of time falls under the label of kronos. In the African world-view, time is a reference that locates communities with respect to their collective past and shared future; it assigns significance to patterns of events; and it orders relationships and affairs. Time is not an independent quantity that can be divided into ever-smaller units; it is a continuum that has meaning only as it is experienced. The ubuntu principles reflected in the African conception of time reflect time as a unifying and integrating construct that emphasizes interdependence, shared heritage, regularity, congruity, and fully experiencing the present. In this sense time is epistemologically very close to the Greek concept of kyros. However, in ubuntu time is not experienced only in the present; it also heals past experiences and allows for reflection. A famous cliché notes that God gave the African time, and the westerner a watch (Fadiman 2000). Misunderstandings over time are not a new source of friction in cross-cultural interactions. These misunderstandings arise, however, not because of differing importance assigned to time commitments, as demonstrated in the example above, but because of fundamentally different meanings attached to time. This is a difficult gulf to span because it requires adopting a different worldview, or at a minimum, accepting the validity and reasonability of a different worldview. In general, South Africans understand the merits of punctuality, deadlines, and the like. On the other hand where ‘western’ timing runs into loggerheads with African ‘timing’, (e.g., in task completions), then that might be an opportune moment to take advantage of the contact time one has invested to solidify relationships and build the rapport that can be used in future business encounters. The western conception of time management will be ineffective at best, and dysfunctional at worst, if it is pitted against the African conception of time. According to IMD world rankings, the South African economy has remained steady during its first ten years of democracy, maintaining its position among the top 50 countries in the World Competitiveness Score Board (IMD 2005). [iv] While this stability is a sign that the country has turned the corner, if dramatic improvements are the goal, then listening and learning what makes the majority worker tick will be at the heart of the solution. Once again, this is where we still have a long way to go. Only a few years ago, a manager of a Taiwan-based multinational corporation observed that it took 800 African workers in his Dimbaza factory in the Eastern Cape, to make 3,000 pairs of jeans per day. He also stated that the same number of Taiwanese workers could manufacture 20,000 jeans per day (Nickerson 1988). How can this low productivity be explained? Some observers would naïvely assign McGregor’s Theory X characteristics to these black workers (McGregor 1960). ‘You have to supervise them all the time. If you are not there, they simply won’t work’ (Manona 1988). A typical western ‘humanistic’ response might be that given the regime that was running South Africa back then, black workers were just reacting to the unsatisfactory work conditions where their basic needs were not being met (Maslow 1943). The real dilemma was pointed out in a study that set out to empirically examine this problem of poor productivity (Beaty and Harari 1987). 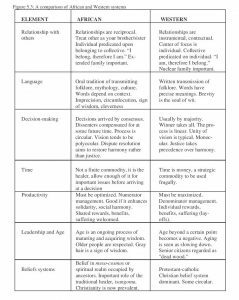 The researchers in that study were astounded to find that their interviewees had completely different priorities than those assumed by westerners. For example, the workers assumed that their firm was responsible for their well-being both on and off company premises, i.e., 24 hours around the clock. The western conception of employer-employee relationships usually begins and ends at the workplace. In fact, the differences were so extreme that the study in its original form had to be abandoned. The conclusion from that experience was that management would learn more by ‘active’ and ‘naïve’ listening to their black workers in order to understand their worldview. In the western literature productivity is defined in organisational terms – obtaining the maximum useful output from a given set of resource inputs. Productivity is assumed to be a critical determinant of organisational viability. Efficiency – the ratio of output value to input cost – embodies the technical aspect of productivity, and maximizing efficiency is the sine qua non of western management theory. In the African setting, on the other hand, the emphasis is on social well-being rather than technical rationality. In the African world-view as guided by ubuntu, efficiency maximization takes lower priority than societal harmony. Attempts to increase efficiency at the cost of fractured relationships and social disruption can have unintended consequences. For instance, western managers whose training emphasized what some have called ‘denominator management’, would see a cutback in the number of employees as a means to increased productivity. In Africa, where work is a social as well as practical activity, it cannot be assumed that the numerator and denominator in the productivity equation are independent variables (Prahalad and Hamel 1994). Employee cutbacks (denominator reduction) would have significant negative impact on output (numerator reduction) likely resulting in reduced, not increased, productivity. Multinationals often resort to between-country unit productivity comparisons to the total exclusion of the national contexts of the countries being compared. So for example they would state that in one country a production line could be run by two less operators than in a developing country. Logic would suggest that two operators could be removed from the line or laid off. Such a decision might be easy to explain in western contexts but not in Africa. It carries the risk of alienating the entire workforce and resulting in a decrease in productivity as well as other disruption. The highly collectivist orientation of the African culture would favour a system that spreads the burden over everyone during hard times (or rewards during good times) instead of making a few individuals suffer all the pain (or collect the entire reward). In that sense, across the board pay reductions would be much preferred to targeted layoffs. Again another example demonstrates this situation (Beaty and Mangaliso 1999). The CEO of a South African manufacturing firm visited the nearby township to view the housing conditions of his workers. Appalled by what he saw, he initiated a program in which his firm built immaculate three bedroomed-carpeted houses for his black workers in the township. The firm partially subsidized the mortgage payments and deducted 25 per cent of a worker’s salary to contribute to the mortgage. The company also gave the employees the option of selling the house back later and keeping the profit. But the CEO was surprised by the negative reaction of his employees to the scheme. Despite the knowledge he had gained from his first hand experience, he noted the root cause of the breakdown. We’ve had some problems. Had we gotten involved and worked with the right leaders in the planning of the scheme from the outset, we would have learned that they preferred the money be used instead to upgrade a greater number of existing dwellings so that more of the company’s employees could benefit. This story demonstrates the dilemma facing managers of western-based firms in developing countries. The performance criteria of the organisation – productivity, efficiency, increased output – may be in direct conflict with the traditional values of the country – solidarity, group well-being, social harmony. The two are not necessarily incompatible and if some consideration is given to protocols and proprieties, change can be introduced with minimum disruption. In fact, as was discussed above regarding decision-making, when properly communicated and deliberated, even difficult change can be implemented effectively. The lesson learned from the foregoing can be summed up in the following way. Western conceptions of organisational productivity and efficiency are inappropriate measures in an African world-view. Attempts to increase efficiency without consideration of concomitant social impacts will result in reduced organisational productivity. Change must be introduced using consultation and inclusive decision processes if it is to be implemented without disruptive effects. This is ontologically different from the western change management approaches where overall corporate performance is the primary determinant of success (Beaty and Harari 1987; Schiel 1990). One senior manager at a major industrial firm in South Africa told us that when the company initiated a black advancement program, the first blacks promoted to supervisory positions were young men (20 to 24 years old) who had performed very well. The workers of the group these men were assigned to supervise refused to work for them. When senior managers probed, they found that within the culture of those workers, older men do not work for ‘youngsters’. Management then revised their promotion criteria to include age as well as capability (Beaty and Mangaliso 1999). Sometimes the ‘professionalism’ displayed by young, western-trained managers is misinterpreted and resented by other employees, as witnessed in the case of an African manager who was summoned before his family elders because he did not treat the workers as brothers but as employees (Ahiauzu 1986). An older person might not necessarily possess all the expertise for the task at hand, but through his/her wisdom, vision, and ability to maintain harmonious working relations, s/he can get others to perform well. There is no question that technology has altered the workplace, giving an advantage to younger people in their twenties and thirties who are more comfortable with technology and more responsive and adaptable to change than those in their fifties and sixties. But older workers bring a lot of value to the workplace, which is likely to increase as economies expand. 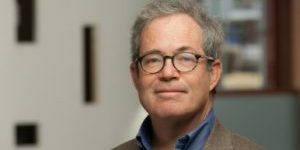 As Grossman (2005) notes from his empirical study of discrimination against older workers in the US, marginalizing these employees may prove more costly in the future as employers look for older workers to fill projected workforce gaps. In reality, a manager in the work environment must have the appropriate balance of skills between technical competence and social savvy. Ironically, this approach to managing is gaining increasing acceptance even in the context of more contemporary western thinking. More successful managers are seen to act as coaches, cheerleaders, nurturers of champions rather than cops, experts, and naysayers (Peters and Waterman 1982). The lesson to be learned here is that in the African thought system, age is regarded as an asset, an ongoing process of maturing and acquiring wisdom. To the extent that management understands this difference in their selection and promotion of people into leadership positions, they stand to be more successful in the implementation of programs such as productivity improvement, employee motivation, worker satisfaction, and workplace harmony. The criteria for selecting employees into leadership position must not be limited only to demonstrated mastery of technical skills. Other criteria embedded in the culture, such as age in this case, must also be taken into account. Because of migration over the years in search of job opportunities and a better life style, a majority of the African population in SA is urban. Many can still trace their ancestral roots to the rural areas, and others still live in these areas and have temporary dwellings such as hostels and dormitories in the urban areas where they work. Christianity is the dominant religion for over 90 per cent of Africans in SA. But one thing that is noticeable is how those who straddle the urban-rural divide still uphold beliefs in the spiritual world. They use both the western trained physician and the traditional healer or isangoma or inyanga. Even though over 80 per cent of the black labor force consults the traditional healer, western managers have tended to downplay their centrality, or ridicule their involvement in their employees’ health maintenance (Ustinov 1999). Others have wisened to the power of the isangoma and used it to full advantage (Beaty 1996). In cases where the management and the workers come from entirely different epistemological and cultural worldviews, the company would preempt a potential fall-out by positively engaging in the worldview of its employees. If a large proportion of the workforce believes in the power of mesocosmic spirits, it makes sense for the company to retain the services of a company isangoma along with those of western-trained company doctors. Such an individual would presumably have been oriented in the company’s vision and mission to have sufficient appreciation of the symbiotic relationship between community values and the continued viability competitiveness of the company. In time, s/he would most likely also suggest appropriate remedial action that would accommodate both worldviews. After all, companies do hire company lawyers, company public relations officers, and several consultants to solve ad hoc problems as they arise. The concurrent belief in the mesocosmos and the role of the sangoma, makes him/her a key player in the process of mediation and arbitration. The lesson from all these stories is that companies must learn and understand the belief systems of the community in which they operate. They must adapt their systems to fit local belief systems while encouraging the local community to appreciate that company success is tied to the availability of jobs and hence community prosperity. A few guidelines are worth noting in order to unleash the power of ubuntu in organisations. Treat others with dignity and respect. In business engagements with the locals, the objective must not be to tell, but to share. The key is to move away from the parentchild mode of interaction that was fashioned over the apartheid years, and replace it with the parent-parent mode (Berne 1964). The slightest perception of a patronizing disposition might trigger the old primordial sentiments among workers – invariably mostly black – that the former apartheid regime elicited. In fact, during the apartheid years it was considered a tautology in South Africa to speak of black workers since all workers were black (Mothlabi 1987). And that response is to undermine the system that has been responsible for their oppression. On the other hand, if they sense that they are being treated with respect and dignity, the human inclination is to rise up to expectations and deliver the expected results and more. Be willing to negotiate, not dictate. The new spirit of democracy requires those in management positions to negotiate. Prior to the recognition of workers’ unions during the years of apartheid, many employers were reluctant to get into negotiations with employee representatives. They feared that employees would take entrenched positions and not accept any compromises to their positions and erode their power. The reality that they found after the collapse of apartheid surprised them. They found employees not only willing to find the middle ground, but as an executive of a large corporation near Durban in KwaZulu-Natal naively noted in an interview, ‘blacks have taken to negotiation as ducks take to water’ (Mangaliso 1988). He did not realize that negotiation was part and parcel of the socialization in which blacks are brought up in the culture of ubuntu. Provide opportunity for achievement, self-fulfillment, and values. Ubuntu is about what people value, what people aspire to be. 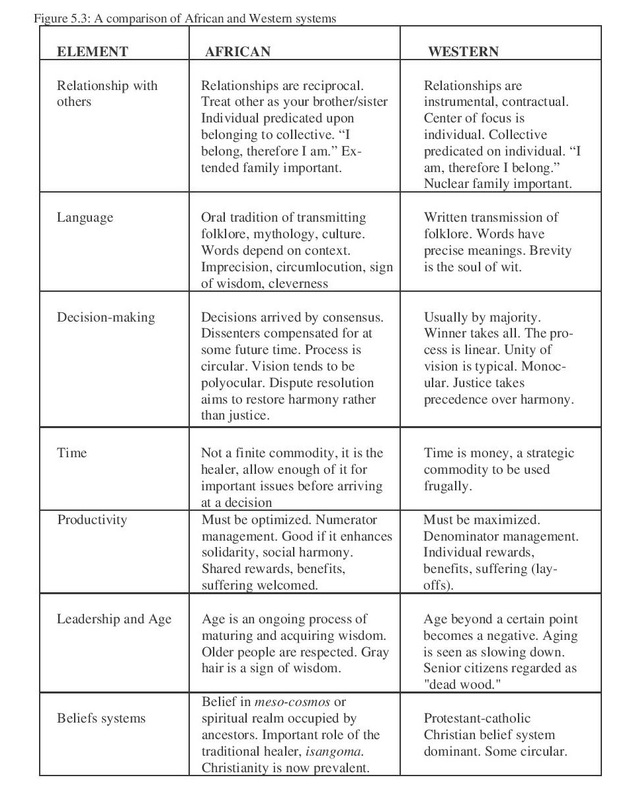 Peter Drucker notes that organizational effectiveness results when two needs are harmonized: the need for the organisation to obtain from the individual the contribution it needs, and the need for the individual to have the organisation serve as his/her tool for the accomplishment of his/her goals and objectives (Drucker 1993). In the context of South Africa, organisations that provide an opportunity for their employees to give expression to their values and beliefs in the course of carrying out their corporate responsibilities are likely to outperform those that do not. Punctuate achievement with ceremonies. One of the common practices of ubuntu is the celebration of major accomplishments and milestones with ceremonies. African society boasts an extremely rich repertoire of ritual, and attending forms of music and singing, dance, and the eloquent verbal expressions of praise singers. Western-style annual year-end socials and celebrations of key anniversaries of service with the company provide a convenient outlet for the need for ceremony. At Unilever, SA ceremonies were held annually to celebrate those who had completed 10, 15, 20, and 25 years of service with the company. These employees were given awards according to the milestones they had reached, and also received a citation in the company’s newsletter, Inspan. 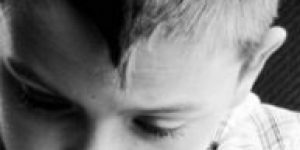 These practices promote the sense of trust, loyalty and family belonging, while at the same time feeding into the primeval needs of ubuntu. Embrace and encourage the employment of kinspeople in your organisation. In western settings, hiring relatives is usually considered to be bad because of the negative stereotypes associated with nepotism. In the African context, kinship ties within the organisation are seen as beneficial. This is so because the most important organizing unit among Africans is the family in its various forms. Family not only includes the nuclear family, but strong bonds exist with members of the extended family, people who graduated from the same high school or university, people whose origins can be traced to the same town or homeland (the ‘homeys’). The presence of these kinship tiesin the workplace provides a layer of emotional and psychological support to workers. For promotion into leadership, honour seniority. All things being equal, in choosing someone into a leadership position from among equally qualified employees, the ubuntu ethos would tip the scales in favour of the one with more seniority in terms of either chronological age, service to the company, or experience in the position. The corollary to this is that the more junior employee will get his/her turn in some future date. The metaphor ‘Zisina zidedelana’ signifies that in a dance each person will get his/her turn in the spotlight. [v] This is not uncommon in other, non-Western cultures. For instance, according to former Mitsubishi Executive Takachi Tekeuchi, in Japan the amount of money a person makes between 21 and 50 is much less than they make once they are over 50. This is a practice that rewards seniority and encourages loyalty to the company with the expectation that once employees reach seniority, they will be rewarded handsomely (NBR 1997). Promote equity in the workplace. Equity defined as the perception of fairness in the workplace is important in the African way of life. The unfortunate legacy of apartheid in South Africa is that it systematically discriminated against blacks to the point that they are now grossly underrepresented in the key decision-making positions in many organisations. An example of this can be seen in a report that evaluated the impact of the Employment Equity Act of 1998, which required all enterprises employing more than 50 employees to take affirmative action to bring about a represented spread of designated groups in all occupations and organisational levels. This report indicated that although African males constituted 39 per cent of the workforce, they made up just 10 per cent of management. By contrast, white males who constituted 13 per cent of the workforce made up 52 per cent of management (Dept. of Labor 2000; also see Mbabane 2004; Williams 2001). The figures for black females indicated even wider disparities. For the year 2003-2004 another report indicated that of all top management positions white people still accounted for 72.2 per cent, black people accounted for only 23.8 per cent, while a paltry 14.1 per cent of women were represented in top management positions (Africa News 2005). Since then, many analysts have raised concerns about the very slow progress in the implementation of employment equity in South Africa and the poor enforcement of the EE Act (Mbabane 2004). There is, therefore, an urgent need to identify, attract, recruit , and promote capable blacks into management positions. On the flipside of the coin is the larger question of how the legislature impacts the economy as a whole. While it is difficult to quantify this impact, the responses obtained from South African CEOs in a survey conducted by the World Bank cited the inflexibility of labor regulations and union activities as discouraging employment creation (see Lewis 2001). This indicates the need to balance the need for the enforcement of the EEA legislation with the imperatives of sound macro-economic policies. Be willing to learn, flexible, and accommodative. South Africa consists of an array of people with diverse cultures and traditions all interwoven into a mosaic of colourful folklore. Up until recently, the accepted modus operandi in business has been the western tradition. But other traditions are increasingly becoming commonplace, for example the traditional healers (izangoma) referred to earlier. The best thing to do is to be willing to listen and learn from those who are familiar with the culture about the applicability and legitimacy of some of the practices one will encounter. The best strategy is to treat each cultural exigency with caution, care, and understanding. Flexibility and accommodation will go a long way towards creating an atmosphere of mutual respect and an increased sense of identity with the company among employees. Before discussing the implications of ubuntu in SA it is important to point out some disclaimers. The first is a caution against a wholesale justification of all African customs and practices as has been pointed out before. There are several customs and practices based on unsubstantiated superstitions that can be oppressive and sexist, that might stifle individual aspirations and societal progress. [vi] Conventional wisdom is that customs will be respected to the extent that they serve a good purpose. Otherwise they should be challenged and changed. In general, however, customs have helped in reinforcing a common belief in humaneness, creation of a sense of dignity and common humanity, empathy for others, and a common bond among members of society. Another caution is against the assumption that culture is static and that there is a one way causal relationship between culture and behaviour. 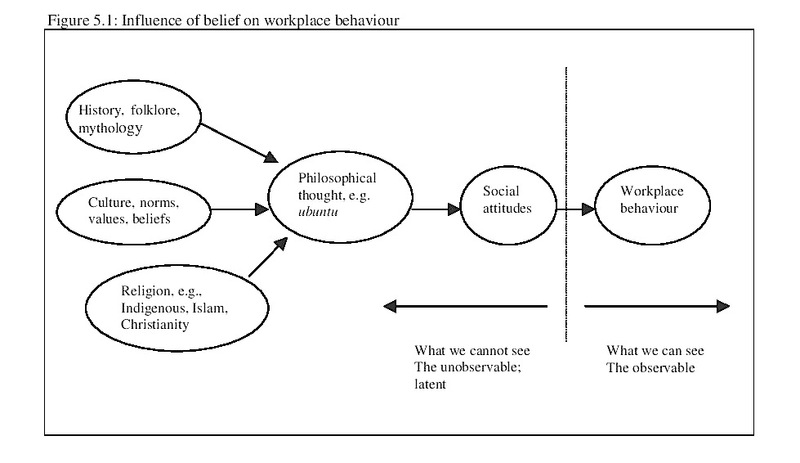 Changing behaviours can also cause changes in culture through feedback and reinforcement over time. Differences between the behaviours of younger and older generations contribute to the ‘generation gap’. In SA differences can be perceived between urban and rural blacks; and between those who are migrant workers and squatter-camp dwellers on the one hand and those who live in upper middle class neighbourhoods on the other. What are the business implications of ubuntu in the transformation process now taking place in South Africa? To start off, foreign and local white-controlled companies must be willing to work in partnership with indigenous people with the understanding that they will listen to and learn from them. There are several success stories that have come out of such collaborative efforts. One such example is the giant company American Express that formed a joint venture with the black company PulaNala in the travel and tourism industry. As a result of the partnership, American Express has become highly responsive to the shifts in the travel industry. For PulaNala, the relationship will facilitate the transfer of business skills and the accelerated development of personnel into areas of executive responsibility (Mkhuma 1998). Several similar alliances have been formed under the auspices of the Black Economic empowerment programme. It is our hope that the ideas, philosophies, customs and culture that emanate from ubuntu will be infused into the corporate policies and procedures of these new alliances. In the face of fierce global competition, ubuntu might be the distinguishing feature to tip the scale in favour of companies that espouse it. We conclude by restating our thesis that, in order to be effective, management principles and practices must receive the embrace of their host cultures. Effective management in South Africa will hinge on the successful harnessing and harmonizing of both indigenous and corporate cultures. Unfortunately, up to now the emphasis has been on suppressing indigenous cultures rather than appreciating their utility. Western culture has been allowed to freely dominate all spheres of corporate life with little or no account taken of indigenous worldviews. With democracy in SA has emerged a new sense of pride and assertiveness among Africans about their indigenous cultures and heritage. It can therefore be expected that they will seek to give expression to those practices they regard as important in their day-to-day corporate life. For management, the challenge is to become familiar with the African cultural practices described in this chapter and, whenever practicable, incorporate then in formulating company policies. Companies whose policies are perceived to be responsive to the needs and worldview of their employees will out-perform those perceived to be otherwise. For organizational researchers, the challenge is to chart a new research agenda that will incorporate the ideas shared in this paper. Already there are scholars who have begun to conduct such research to help sensitize expatriate business managers about the vagaries and vicissitudes of conducting business in South Africa (Fadiman 2000). As the sun continues to rise, to banish the darkness of the long years of colonialism and apartheid, what the new light of our land must show is a nation diligently at work to create a better life for itself. … We trust that what we will do will not only better our own condition as a people, but will also make a contribution, however small, to the success of Africa’s Renaissance, towards the identification of the century ahead as the African Century (BBC News 1999). We endorse this vision completely. But if it is to be translated into reality in the corporate world, then this paper calls for a ‘renaissance approach’ toward managing businesses in South Africa. From this approach will come important ideas that can help practitioners in the development of culturally inclusive approaches to managing in South Africa, and thus spark the renaissance spirit envisioned by the President. A challenging goal and yet one that is full of promise. i. For an extended discussion on uncovering the deep seated origins of culture see Geertz (1973), and Giddens (1982); and for a deeper explication on primordial sentiments see Shils (1957), and Stewart (1987). ii. In this paper we will use the term ‘Africa-centered’ in the Keto (1989) sense in order to posit Africa as a geographic and cultural starting point for the study of people of African descent. It. conveys the same meaning as the term ‘Afrocentric’ used by other authors (e.g. Asante 1980; Schiele 1990; Williams 1991). iii. We use the term ‘indigenous Africans’ to indicate Africans whose ancestral roots are in the continent of Africa. iv. IMD is the International Institute for Management Development based in Lausanne, Switzerland. It is considered to be among the best business schools in the world in executive MBA training and has been the publisher of the World Competitiveness Yearbook since 1989.
v. Some people believe that in 1994 President Nelson Mandela and the African National Congress did invoke age as a criterion in selecting the country’s Deputy President. Aside from his talents and distinguished service in the struggle for South Africa’s liberation, the then Deputy President Thabo Mbeki was chosen over Cyril Ramaphosa, a more visible figure during the CODESA transitional talks, due in part to his seniority. vi. An example among the Batswana is the custom of mogaga which requires a widow to sprinkle leaves each time she leaves her homestead for a 12-month period of mourning. This custom is based on the belief that mourning and respecting the dead this way is vital for the protection of the livestock against infertility. Many, including human rights advocates, have criticized this custom as sexist and archaic: it applies only to widows, and its connection with the protection of the livestock against infertility is tenuous. Aaker, P.J. (2002) Can mixed emotions peacefully co-exist?, Journal of Consumer Behavior,/em> 28(4): 636-49. Africa News (2005) Government should intensify its employment equity policies, 1 June, available at: http://web.lexis-nexis.com. Ahiauzu, A.I. (1986) The African thought-system and the work behavior of the African industrial man, International Studies of Management and Organisations, 16(2): 37-58. Antonio, D. (2001) The challenges for Africa: A culture of peace, good governance and peoplecentered development, Asia-Pacific Review, 8(1): 63-74. Asante, M.K. (1980) The Afrocentricity, Trenton, NJ: Africa World Press. Barnard, C.E. (1938) The functions of the executive, Cambridge, MA : Harvard University Press. Beaty, D.T. and Harari, O. (1987) South Africa: White managers, black voices, Harvard Business Review, 4(July-August): 98-105. Beaty, D.T. and Mangaliso, M.P. (1999) New lessons on management transformation from South Africa, Proceedings of the Conference on Managing in a Global Economy, Prague. Beaty, D.T. (1996) Eurocentric or Afrocentric? In mastering management, part 2, Business Day Supplement, Johannesburg, SA, p. 15. Berger, P.L. & Luckman, T. (1966) The social construction of reality: A treatise in the sociology of knowledge, Garden City, NJ: Doubleday. Berne, E. (1964) Games people play: The psychology of human relationships, New York: Grove Press. Bisetty, V. (2000). Zulu Professor gives voice to language woes, The Mercury,Durban,25 September, available at http://www.iol.co.za/. Brack, G., Hill, M.B., Edwards, D., Grootboom, N., and Lassiter, P.S. (2003) Adler and Ubuntu: Using Adlerian principles in the new South Africa, Journal of Individual Pyschology, 59(3): 316-26. Chick, J.K. (1990) The interaction accomplishment of discrimination in South Africa, in D. Carbaugh (Ed. 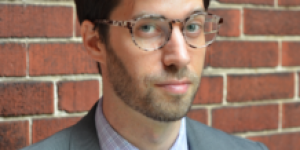 ), Cultural communication and intercultural contact, Hillsdale, NJ: Lawrence Erlbaum Associates. Comaroff, J. and Comaroff, L.J. (1989) The colonization of consciousness in South Africa, Economy and Society, 8(3): 267-96. Crowe, S. (1995) White South Africans learn Zulu and much more, Christian Science Monitor, 13 November: 1, 13. DOL (Department of Labor) (2000) Employment equity report, executive summary, Pretoria, 2 October. Drucker, P. (1993) The effective executive, New York: Harper Collins. Emminghaus, W.B., Kimmel, P.R. and Stewart, E.C. (1997) Primal violence: Illuminating culture’s dark side, Peace and Conflict: Journal of Peace Psychology, 3(2): 167-91. Fadiman, J.A. (2000) South Africa’s black market: Doing business with Africans, Yarmouth, ME: Intercultural Press. Festinger, L. (1957) A theory of cognitive dissonance, Evanston, IL: Row & Peterson. Giddens, A. (1982) Profiles and critiques in social theory, Berkeley, CA: University of California Press. Government Gazette # 16861 (1995) Employment Equity Act, No. 66, Republic of South Africa, Pretoria: Government Printer. Grossman, R.J. (2005) The under-reported impact of age discriminaton and its threat to business vitality, Business Horizons, 48: 71-8. Gudykunst, W. (1991) Bridging differences, Newbury Park, CA: Sage Publications. Hampden-Turner, C. and Trompenaars, A. (1993) The seven cultures of capitalism, New York: Currency/Doubleday. Hofstede, G. (1980) Culture’s consequences, Beverly Hills, CA: Sage Publications. 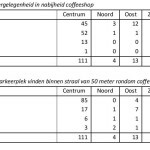 Hofstede, G. (1991) Cultures and organisations: Software of the mind, London: McGraw-Hill. 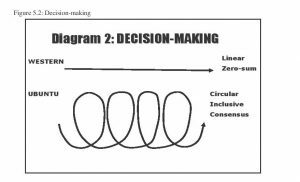 Homburg, C., Krohmer, H. and Workman, J.P. Jr. (1999) Strategic consensus and performance: The role of strategy type and market-related dynamism, Strategic Management Journal, 20(4): 339-57. Jordan, B.V. (1995) Using the English language, South African writers fight back against the colonizers’ writings and philosophies, unpublished PhD Dissertation, Albany, NY: State University of New York. Jun, J.S. (2005) The self in the social construction of organisational reality: Eastern and Western views, Administrative Theory and Praxis, 27(1): 86-110. Keto, C.T. (1989) An introduction to the Africa-centered perspective of history, Blackwood, NJ: K.A. Publications. Kiggundu, M.N., Jorgensen, J.J. and Hafsi, T. (1983) Administrative theory and practice in developing countries: A synthesis, Administrative Science Quarterly, 28: 66-84. Lewis, J.D. (2001) Policies to promote growth and employment in South Africa, World Bank, Southern Africa Department, Discussion Paper #16, Informal Discussion Papers on the Economy of South Africa, available at: http://www.tips.org.za/f2001/lewis.pdf. Lufthans, F., Van Wyk, R. and Walumbwa, F. (2004) Recognition and development of hope for South Africa organisational leaders, Leadership & Organisation Development Journal, 25(6): 512-27. Makhudu, N. (1993) Cultivating a climate of cooperation through Ubuntu, Enterprise, 68(August). Mangaliso, M.P. (1988) The relationship of environmental turbulence, strategy preference, and performance: A study of the preferences of North American and South African corporate executives, Unpublished PhD dissertation, University of Massachusetts, Amherst. Mangaliso, M.P. (1991) Whose knowledge matters? The case for developing multicultural theories of management, in J.D. Jansen (Ed.) Knowledge and power in South Africa: Critical perspectives across the disciplines, Johannesburg: Skotaville. Mangaliso, M.P. (1992) Entrepreneurship and innovation in a global context, Entrepreneurship, Innovation and Change, 1: 437-50. Mangaliso, M.P. (1999) Seminar on change management, University of South Africa, School of Business Leadership in Midrand, South Africa, October. Mangaliso, M.P. (2001) Building competitive advantage from Ubuntu: Management lessons from South Africa, Academy of Management Executive, 15(3): 23-33. Manona, C.W. (1988) Impact of urbanization on rural areas: The case of white-owned farms in the Eastern Cape, African Studies, 47: 1-18. Marcic, D. (1997) Managing with the wisdom of love: Uncovering virtue in people and organisations, San Francisco: Jossey-Bass. Maslow, A. (1943) A theory of human motivation, Psychological Review, 50: 370-96. Maslow, A. (1965) Eupsychian management, Burr Ridge, IL: Irwin. Mayo, E. (1933) The human problems of an industrial civilization, New York: Macmillan. Mbabane, L. (2004) Black economic empowerment: The lifeline for employment equity, available at: http://www.lexisnexis.co.za. Mbigi, L. and Maree, J. (1995) Ubuntu: The spirit of African transformational management, Randburg, South Africa: Knowledge Resources, Inc.
McGregor, D. (1960) The human side of the enterprise, New York: McGraw-Hill. Mkhuma, Z. (1998) Happy landings, Enterprise, January: 87. Moser, M.R. (1988) Ethical conflict at work: A critique of the literature and recommendations for future research, Journal of Business Ethics, 7(5): 381-8. Mothlabi, M. (1987) Speech delivered at the South African Education Programme Winter Conference, Iowa State University, Ames IA, March. NBR (1997) Nightly business report, Television programme aired in October. Nickerson, C. (1988) Asian companies find bonanza in South African marketplace, Boston Globe, 22 May, p. 4. Pellow, D.N. (1999) Framing emerging environmental movement tactics: Mobilizing consensus, demobilizing conflict, Sociological Forum, 14(4): 659-83. Peters, T. and Waterman, R. (1982) In search of excellence: Lessons from America’s best-run companies, New York: Harper & Row. Prahalad, C.K. and Hamel, G. (1994) Competing for the future, Boston, MA: Harvard Business School Press. Prinsloo, E.D. (2000) The African view of participatory business management, Journal of Business Ethics, 25(3): 275-86. Roer-Strier, D. and Rosenthal, D. (2001) Socialization in changing cultural contexts: A search for images of the ‘adaptive adult’, Social Work, 46(3): 215-28. Salie, I (2005) Cape moves to make Xhosa compulsory, Sunday Argus, Cape Town, 14 August, available at: http://www.iol.co.za. Schiele, J.H. (1990) Organisational theory from an Afrocentric perspective, Journal of Black Studies, 21(2): 145-61. Senge, P.M., Kleiner, A., Roberts, C., Ross, R. and Smith, B. (1994) The fifth discipline field book: Tools and strategies for building a learning organisation, New York: Doubleday/Currency. Setiloane, G. (1986) African theology: An introduction, Johannesburg: Skotaville Publishers. relationships of sociological research and theory, British Journal of Sociology, 8(2): 130-45. Sithole, N. (1959) African personality, Voice of Africa, 1(8): 18-27. Sono, T. (1994) Dilemmas of African intellectuals in South Africa, Pretoria: University of South Africa. Stasson, M.F., Kameda, T., Parks, C.D., Zimmerman, S.K. and Davis, J.H. (1991) Effects of assigned group consensus requirement on group problem solving and group members’ learning, Social Psychology Quarterly, 54(1): 25-35. Stapleton, T.J. (1991) The memory of Maqoma: An assessment of Jingqi oral tradition in Ciskei and Transkei, History in Africa, 20: 321-35. Stewart, E.C. (1987) The primordial roots of being, Zygon, 22: 87-107. Taylor, F.W. (1911) Principles of scientific management, New York: Harper & Row. Terkel, S. (1974) Working, New York: Pantheon. Triandis, H.C. (2001) Individualism-collectivism and personality, Journal of Personality, 69(6): 907-24. Ustinov, P. (1999) On the trail of Mark Twain, Public Broadcasting Services, home video #B8074-2. Weber, M. (1930) The protestant ethic and the spirit of capitalism, translated by Talcott Parsons, New York: Scribner. Whiteman, G. and Cooper, W.H. (2000) Ecological embeddedness, Academy of Management Journal, 43(6): 1265-82. Williams, R.L. (1981) The collective black mind: An Afro-centric theory of black personality, St. Louis, MO: Williams & Associates.